Wear it over your shoulder while playing an endless shredding guitar solo, AND store all your stuff inside at the same time. 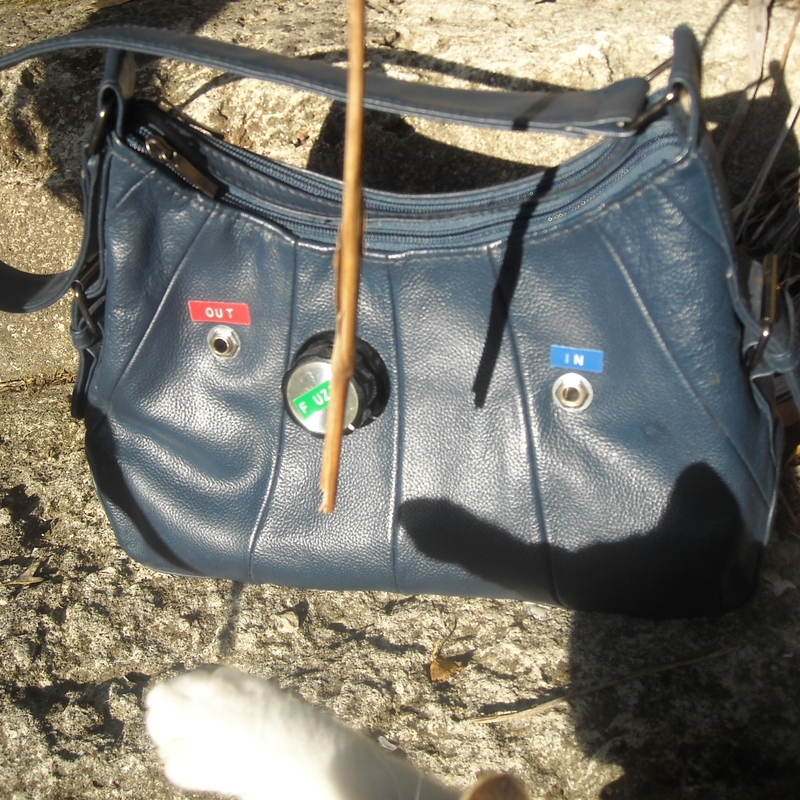 This handbag with built-in fuzz-box will be auctioned off on Sunday night at the Audio Foundation as part of the MEL Fundraiser Film Night. Note kitten’s paw in photo — she’s already bidding on this highly desirable item! 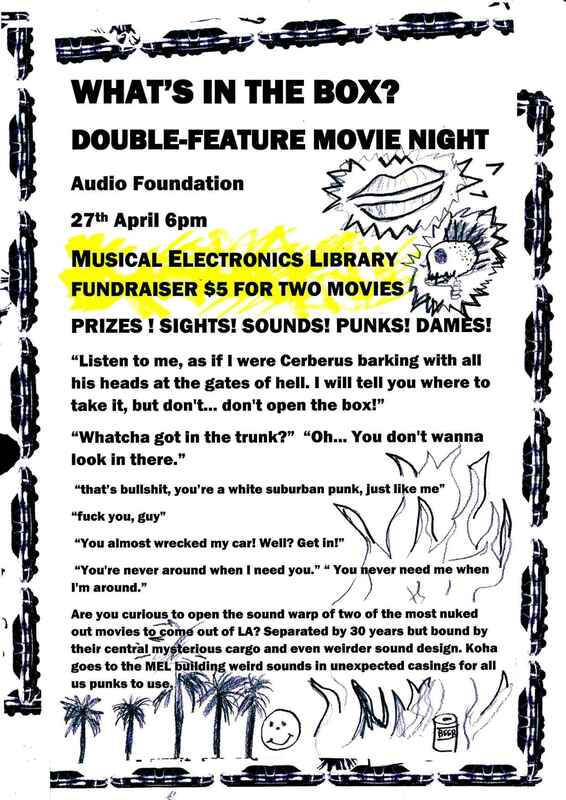 Categories: Donations, Events | Tags: audio foundation, fuzz box, musical electronics library | Permalink. MEL Fundraiser: What’s in the Box? PRIZES! SIGHTS! SOUNDS! PUNKS! DAMES! Are you curious to open the sound warp of two of the most nuked out movies to come out of LA? Separated by 30 years but bound by their central mysterious cargo and even weirder sound design. Koha goes to the MEL building weird sounds in unexpected casings for all us punks to use. Categories: Donations, Events | Tags: audio foundation, St Kevins Arcade | Permalink. How do I start explaining about the truly un-credible world and works of Ciat-Lonbarde? I don’t think I can do this justice, but I’ll try to scratch the surface. Ciat-Lonbarde is a company run by Peter Blasser of Baltimore, Maryland, USA. He makes and sells electronic musical instruments with beautiful, handmade wooden cases, and unusual, touch-sensitive controls. The Ciat-Lonbarde website is bewildering. There’s a lot of made-up language: mido, sandrodes, din datin dudero. My favourite is the “Spesal Cuck”, which is a control that makes a power-supply fluctuate up and down — voltage-controlled power-starvation. The site is also a labyrinth. He doesn’t seem to delete any old info — it’s all in there, stretching back several years, but most of this material is only revealed by a google search. Blasser’s view of electronics is richly metaphorical and not normal. For example, the Plumbutter is conceptualised as “a modern (utopian) city, with factories as the downtown, and a wide swath of organoform, but matricized suburbs, leading to wilde woods.” If you want to read something, look at the technical papers for the Plumbutter and watch your own eyes bug out. But this strangeness is the work of a seriously skilled, inventive, brilliant designer. Ciat-Lonbarde circuits are unique, utilising paradoxical feedback and the touch-weaving of complex paths, to create strident, chaotic sounds as well as tender, shy sounds. The Plumbutter, for example, emits organic bursts and pulses of noise, fluttery drones, subtle pocks of percussion, and storms of moans. As well as selling instruments, Blasser also releases free DIY projects in paper circuit form. The circuit pattern is printed out, folded and glued to thin cardboard, and punched with a needle. Components are then inserted, their leads woven together and soldered to create the complete circuit. I recommend starting with the Lil Sidrassi, which explains the process and shows what all the symbols mean. Peter describes the Lil Sid as “a very touchable bee motorcycle sound maker box”. The design can be customised — several of the capacitor values are deliberately left up to the builder, so that each box will be unique. We currently have two Lil Sids in the MEL collection, each with it’s own character. They are called “Ricko Studio 1 and 2”, in memory of our friend Richard Neave. If you really get into the paper circuits, Blasser has published full instructions to build the Rollz-5, which is a “drum and drama machine”, and the ancestor of the Plumbutter. The Rollz is a big project, I won’t kid you. I’m just finishing mine and it took me a long time. It sounds unlike anything I’ve ever heard. It sounds like a kind of electronic music that hasn’t existed before, that’s fresh and exciting, exotic and strange, but drawing on the familiar raw roots of analogue synthesis. Peter calls it “Post-70s electronics”. Categories: DIY, Review | Tags: ciat-lonbarde, lil sidrassi, paper circuits, peter blasser, plumbutter, rollz-5 | Permalink.